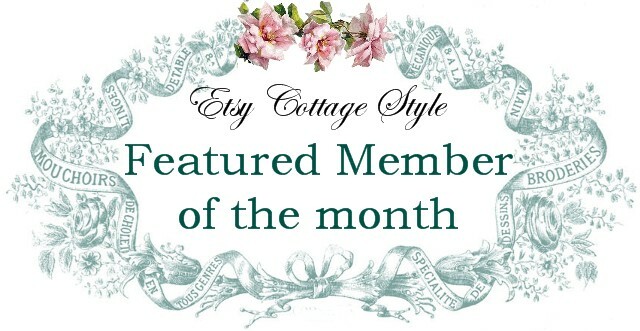 Here is Sandy's bio from her member page...She has been a member since March of 2010 and has participated in our swaps and other activities.. I live in beautiful Derby City USA and I am married to my fav firefighter, Mr. B, for 38 years. I am the Mom of two beautiful daughters, each in the nursing profession. The sunshine in my life is my two grandchildren, Wesley is 4 and Eliza just celebrated her 2nd birthday July 14th. To them, I am "Nan". I love all things vintage, cottage, romantic, and pink and enjoy the “find” in attaining these things, some (many) of which I have a difficult time parting. 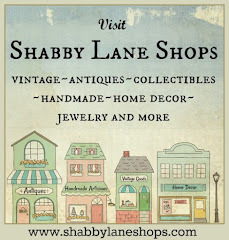 My favorites are antique/vintage linens, vintage jewelry, pottery and vanity collectibles. Mr. B believes all my "stuff" is an obsession, I prefer to describe it as a true passion and appreciation for art, history and a mix of childhood memories together with the warm feelings growing up in the "Wonder Years"! I did open an etsy store recently, Pure Cottage and I also have website where I sell many of my "pretties". Each a work in progress. I look forward to making new friends who have common interests, who love to share ideas, their arts and crafts and collections. I hope to be more active with the ECS too.